Providing precision workmanship to GTA concrete projects since 1986, Pro-Cut Concrete Cutting Ltd. has the experienced technicians for your job. Our family-run business is known for service excellence and works on all types of commercial and industrial concrete construction, from single-storey structures to high rises. Offering a range of concrete services, we specialize in slab and road sawing, wall sawing, core drilling and removal. Pro-Cut Concrete Cutting Ltd. has a fleet of 10 trucks and uses reliable gas, diesel and electric equipment. Whether you need control joints cut or concrete X-raying, we can handle your job. Check out our gallery to see what we can do. 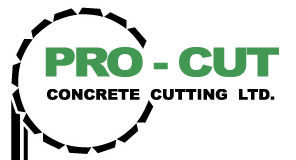 If you are looking for dependable concrete cutting in Toronto and throughout the GTA, contact Pro-Cut Concrete Cutting Ltd.